Whether it is spring or summer, the warmer weather brings thunderstorms. We wanted to address some procedures to follow if you’re noticing leaks from your ceiling during heavy or soaking rainstorms. As it turns out, the saying, “water always wins” has some real truth to it. Everything on the exterior of your home from the roof down is part of what we call the building envelope and even the smallest defect can allow water infiltration. With heavy, wind-driven rains or even steady rains over several days, the chances of developing a leak are more likely. Don’t get me wrong, we all love a good skylight. Who doesn’t want more light inside their home? Who doesn’t want to see the stars from their bed? However, you just can’t get away from it. No matter how well your skylight is installed, it will still be more vulnerable to leaking in heavy rains than a roof with no skylight. You shouldn’t have problems with skylights in any rain condition, but heavy rains, and especially wind-driven rains make them more likely to leak. Plumbing can be another issue for a roof. A broken or incorrectly installed plumbing vent stack will leak in heavy rains. In addition, fan vent hood flashings, as well as furnace flu flashings, are sources for leaks. Brick and mortar chimneys can allow water infiltration due to cracks in the cap and mortar joints. During heavy soaking rains, the water literally soaks into the mortar and will eventually find a path if the rain is heavy or lasts long enough. If you have a brick and mortar chimney, take a look at it for cracked joints or missing bricks, or pieces of brick missing. In addition, take a look at how long it takes to dry after any rain. The flashing can also be and is often the culprit as well. If you have siding on your chimney it is referred to as a “chase”. These are very problematic, especially if you have rotten, splitting, or missing wood siding. Another issue is the tops or “Chase Caps” tend to hold water and eventually the caulk fails and allows water to drip on your fire box. Of course, flashings can also be an issue, but if you don’t normally leak with a “regular” rain, and you spring a leak with a soaker or wind-driven rains, there could be other issues at play. The roof system is your first line of defense during any rain. While often the cause of a leak is defective or failing flashing, caulk, or something else, it is possible that you may have sustained actual damage to your roof. A downed tree limb, blown off shingles, or blown off ridge vent will almost certainly show up as a leak when otherwise you have had none. If your ceiling is leaking, it could indicate that there has been a leak in your attic for some time, and it has soaked the insulation and the drywall. At this point, you may want to get a bucket and poke a small hole where the drip is occurring. That will be a low point in the drywall and allow it to drain. 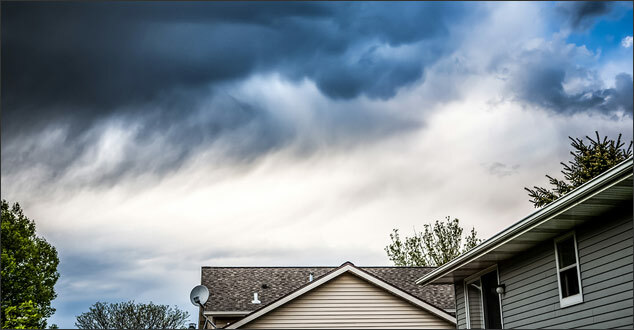 Once the storm is over, call your roofing company. They can come out to cover your roof with a tarp or replace shingles if needed. Furthermore, if there is no actual roof damage they may be able to easily recognize the issue. Second, if your attic is accessible, have a professional go up and clear the wet insulation from the ceiling or at least pull it back. If you are experiencing roof leaks in heavy storms, call your roofing company. Unless you are very comfortable on ladders and roofs, don’t try to do it yourself. If you live in Southeastern Michigan, give us a call. We would be happy to help.